Now before the poodle lovers of the world unite, I do not hate poodles. They may be degenerate mutants, but they are cute ones! We have a pet dog at home. 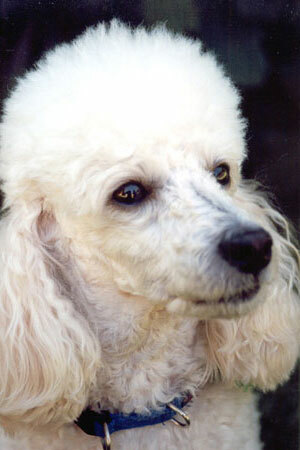 It looks like a poodle, but it’s not a poodle—it’s a Bichon Frise. My friends tell me though that because our dog looks like a poodle and barks like a poodle, then it’s a poodle! Now it may as well be a ‘poodle’ in the sense that it, too, is a degenerate mutant (though I dare not say this in the presence of my wife). Now in Genesis 1:31, God described all that He had created as being ‘very good’. But how could a poodle, with all these mutations resulting in health problems, be described this way? In the journal Science, 22 November 2002, secular scientists reaffirmed something that has been well known and accepted. All dogs from wolves and dingoes down (the word ‘down’ is important as you will see) to poodles are all closely related. From a biblical perspective, this means they are all within the same kind (one of the kinds that God created to reproduce ‘after their own kind’ as we read 10 times in Genesis 1). Now how does this fit with a biblical creationist model of origins? After God pronounced everything as ‘very good’ originally, Adam sinned, resulting in the whole of creation being cursed. Everything began to run down, no longer upheld perfectly by the sustaining power of an infinite creator. Although some mutations can be beneficial (in a limited sense),6 most mutations are harmful. The most serious mutations would not survive ‘naturally’ in the environment, as they would be lost from the population as the dogs that carried them died before reproducing. Also, the reason we call many of our domestic varieties of dogs ‘pure breeds’ is that most of the genetic variety has been bred out of them, and certain mutations have been concentrated within particular groups. So churches teach students (or at least give the impression) that God created poodles (and the other domestic varieties of animals). However, public schools teach their pupils that such creatures have developed by processes of change that are incorrectly presented as ‘evolution.’ Thus, in reality, they are being taught that Christianity doesn’t accept real science and therefore the Bible must be wrong. Savolainen, P., Zhang, Y.P., Luo, J., Lundeberg, J. and Leitner, T., Genetic evidence for an East Asian origin of domestic dogs, Science 298(5598):1610–1613, 22 November 2002. Return to text. Pennisi, E., A shaggy dog history, Science 298(5598):1540–1542, 22 November, 2002. Return to text. Spetner L.M., Not By Chance! The Judaica Press Inc., Brooklyn, New York, 1997. Return to text. Wieland C., Muddy waters: clarifying the confusion about natural selection, Creation 23(3):26–29, 2001; Wieland C., Goodbye, peppered moths, Creation 21(3):56, 1999; Lester, L., Genetics: no friend of evolution, Creation 20(2):20–22, 1998; Gitt, W., Information, science and biology, TJ 10(2):181–187, 1996. See also Q&A:Speciation. Return to text. Gilbert, L., Pet crests, <www.petcrest.com/poodlehi.html>, 1 April 2003; Standard Poodle, ThePuppyShop.com, <www.puppydogweb.com/caninebreeds/poodles.htm>, 1 April 2003; The American kennel club, The Complete Dog Book, Howell Book House Inc., New York, pp. 609–617, 1979. Return to text. While some mutations can be beneficial, they are not evidence for evolution, because they don’t add any new information to the genome. For example, if a beetle on a windswept island is born without wings, it would be less likely to be blown into the sea. 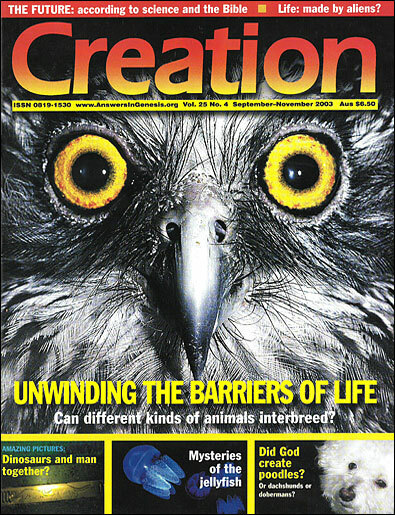 See Wieland, C., Beetle bloopers, Creation 19(3):30, 1997. Return to text.